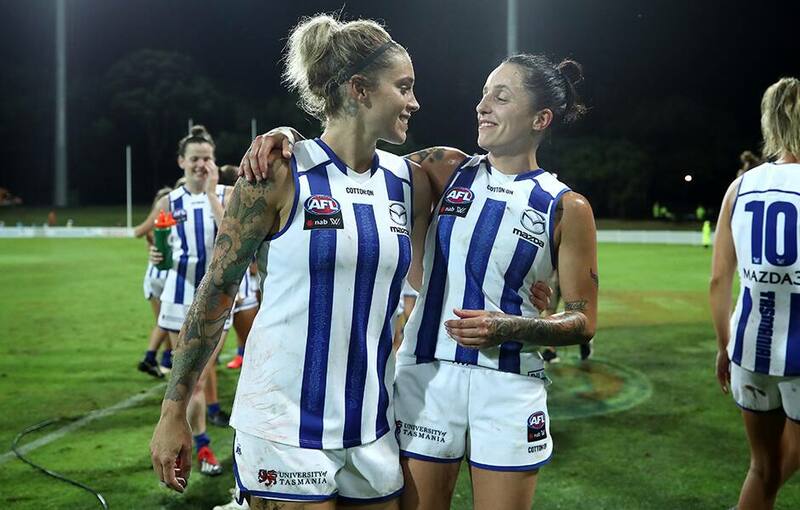 The North Melbourne Tasmanian Kangaroos have shrugged off two weather delays and a gutsy Greater Western Sydney outfit to continue its dream start to the NAB AFL Women's competition and post a 25-point win on Friday night at Drummoyne Oval. The Kangaroos entered their debut season in the AFLW as one of the favourites and they showed why with a 7.6 (48) to 2.11 (23) victory. The start of the match was delayed by 43 minutes after lightning and heavy rain hit the ground in Sydney, with the game eventually getting under way at 7.58pm AEDT. Then with four minutes and 38 seconds left in the second term, three light towers went out. Both teams were sent to their respective changerooms by the umpires before the lights were restored. The rest of the second quarter was eventually completed, followed by a six-minute half-time break, rather than the usual 20, as per AFL football operations manager Steve Hocking's directive. GWS trailed by only eight points at the final break but a couple of quick goals from star North ruck Emma King effectively ended the contest. A left shoulder injury for Giants defender Emma Swanson early in the first quarter ruled her out of the game, while the Roos will monitor Ashleigh Riddell's right ankle concern, who was sporting crutches after the contest. Is there going to be a game? For a while, it looked like the answer might have been no. The start time was pushed back twice as heavy rain and lightning lashed the oval. Then in the second term, there were issues with the light towers. GWS coach Alan McConnell took advantage of the opportunity to have a word to his charges from behind the fence, while the players stayed inside the field of play in an attempt to avoid breaking any rules. Ultimately though, North Melbourne's superior talent levels won out in conditions not conducive to clean football. The move by Roos coach Scott Gowans to push King into attack for the final term was inspired. She proved too hard to handle for Giants defender Louise Stephenson, booting two goals within a couple of minutes and narrowly missing another set shot. For most of the match, North held the ascendancy. Late in the third term though, the Giants had the momentum and Irish forward Yvonne Bonner was at the forefront of that. She positioned herself well to take a nice mark and kick a goal, and not long afterwards Bonner won a free kick. That attempt missed though, and instead of closing the gap to three points, it was eight, and the Roos dominated from there. An excellent sidestep from Cora Staunton with just under seven minutes left in the game gave the Giant a chance to bring her side back within 15 points, as she straightened up for goal. However, she was never allowed that opportunity after a brilliant chasedown tackle from Jess Duffin. North faces a big test as it looks to go 3-0, coming up against the reigning premiers in the Western Bulldogs, with Roos superstar Emma Kearney to face her former side next Friday at 7.15pm AEDT at University of Tasmania Stadium. The following day, GWS hosts Carlton at Blacktown International Sportspark at 4.45pm AEDT.